Back in 2004, Anthony Casalena was a college student who just wanted to make a personal website. Dissatisfied with the tools available at the time, he decided to build his own. And Squarespace was born. Squarespace is a do-it-yourself website builder, blogging platform and hosting service that lets any business easily build a professional-looking website just by dragging and dropping elements on the page. Built with design and ease-of-use in mind, Squarespace is a one-stop shop that encompasses everything that was missing from other website development services Casalena had tried. "At the time, you had to seek out and put together a mix of blogging software, statistics software, page-builder software and Web hosting services just to get a coherent-looking site published online," Casalena said. "I wanted something where the parts fit together seamlessly." The more critical problem was that no company seemed to base their service around design, Casalena said. "Your website is a representation of your online identity. Having a modern, professional site design that lets your content shine is really important to how you will be perceived," he said. In creating Squarespace, Casalena wanted to provide an all-in-one solution and a platform that allowed users to build beautifully designed websites. "I wanted a service that focused on both of these things at its core," he said. Casalena, CEO and founder of Squarespace, talked with BusinessNewsDaily about the story behind the company and how Squarespace can help businesses thrive online. BND: You launched Squarespace from your dorm room and turned it into an award-winning company with roughly 200 employees. What has the journey been like, and what are some of the biggest challenges you've faced before reaching this kind of success? A.C.: Culture has always been the biggest challenge inside a company that has grown the way we have. A company that is adding team members rapidly has very serious personnel and structure needs that often crop up before you have a chance to find the right people to address them. The second challenge we constantly face is bringing our product to market ahead of the technology curve. There's a perpetual race to not only have the best product on the market, but also spread the word to consumers that your product exists. Competitors with huge marketing budgets can often outpace smaller companies by just being present in consumers' minds, not necessarily because they have a better offering. BND: Over the next 12 months, you plan on doubling the size of your team to nearly 400 employees, investing $15 million in new tech jobs in New York City and $3 million in Dublin, Ireland. In which areas are you hiring? What kinds of skills, traits and personalities is a company like Squarespace looking for? A.C.: We'll be looking to double every department in the company. When we hire, there are three traits that are top of mind: alignment, communications and judgment. Our ideal candidate is on the same page as the company when it comes to what kinds of problems we strive to solve and what our mission is. They are people with whom we can speak openly and honestly. Finally, they are people whose decision-making processes we can trust. Squarespace operates with very small, nimble teams, and we want to make sure we are working with the kind of folks who we can empower to make great decisions on their own. BND: Squarespace has experienced massive growth. What kind of demand have you seen from small businesses using Squarespace? A.C.: We see incredible demand from small businesses using Squarespace, and they've always been at the core of the audience we target. As a small business, how you are perceived on the Web is exceptionally important. Squarespace websites look incredible, and the all-in-one nature of the platform means you've got room to expand no matter what sort of content you might be publishing. Also, we recognize that running a small business is incredibly challenging, and we hope that we can help small businesses use their time more efficiently. Constructing and managing a website that represents what you do is a crucial part of building your brand. We want to help small businesses spend as little time on their websites as possible, so they can focus on what makes them special. 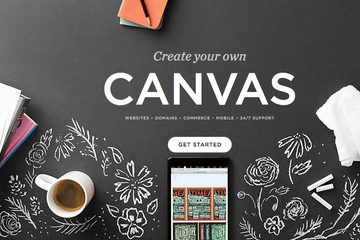 BND: Why should small businesses use Squarespace? What makes Squarespace different from other do-it-yourself online website builders? All-In-One — Squarespace was designed from its inception to be an all-in-one content management system. We effortlessly handle blogs, online stores, pages, calendars and more within a single platform. No plugins are required. Design — Squarespace websites are stunning, to the point of allowing some of our end users to win CSS design awards for their sites. We spend an immense amount of energy on our designs. Customer Experience — We try and design every aspect of our customer experience with our service. Half of our company is dedicated to customer care, and we serve our customers 24/7, with an average response time of under 10 minutes. BND: Building websites is just the beginning for a small business. What else does Squarespace have to offer to help small business users launch and grow their companies online? A.C.: That's a great question. While we cannot reveal too much about product roadmap, we're definitely spending a lot of time thinking about what other tools users need to help establish their online identities and grow their businesses. BND: Squarespace's accolades include being named as one of America's Most Promising Companies by Forbes. You also made it to their list of America's Most Promising CEOs Under 35. Where do you see the future of Squarespace and Web development going? A.C.: We have quite a few major developments in the works. The last 12 months have brought us some really incredible releases, from e-commerce to new mobile apps that are launching today. With a team of more than 200, we can accomplish a remarkable amount at once. You can expect some great innovations from us across both the vertical markets we serve — [which consist of] photographers, business websites, stores, blogs, restaurants, etc. — and the general Squarespace ecosystem.